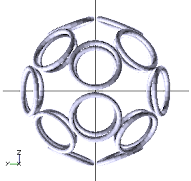 Note how much skinnier the 20 and 8 toroid forms are than their 12 and 6 sided duals. 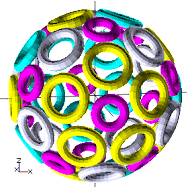 30 toroid, colors added to make sense of the many parts. The first two (6 and 8) are just complements of each other. 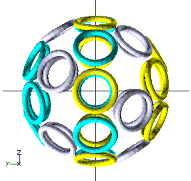 They are both approximate cubeoctahedrons. 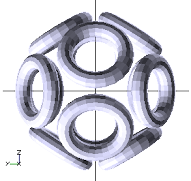 In the "6", the 6 square faces of the cubeoctahectron are the real toroidal magnets and the 8 triangular faces are virtual. In the "8" it is the triangular faces that are real and the squares that are virtual. I am not sure the 8 is any better than the 6, but it could be. 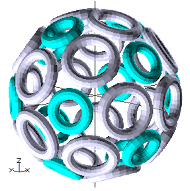 I suspect the 12 and the 20 are the same situation for the icosidodecahedron. Kiteman, you are correct that the 6 and 8 are duals, as are the 12 and 20. 32 toroids, a merge of the 12 and 20 side layouts. The rumored Iranian polywell is supposed to have 32 magnets, in unspecified layout. 42 sides, 12 and 30 side merge. 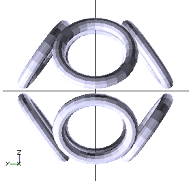 For these drawings, openscad. 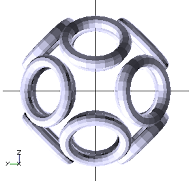 I can post source code for the models if people are interested. Not for me, thanks. I did a little looking at openscad. I find the idea of a modeler-from-script counter-intuitive (but potentially interesting for serendipity). I admit my bias stems from my work with interactive modelers. Both methods have their place, as there are somethings that are easier to do via scripting, while others work better to directly manipulate the polys "visually". I can see that particularly for things like... screw threads! A more tedious chore to model I hope never to imagine. 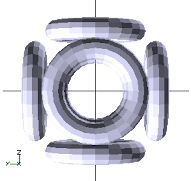 In addition to being a thankless task, modeling screw threads is or should be useless and unnecessary. Those pics, and the talk of modeling via scripting, makes me want to break out POVRay again for some playing around.